This is the story of one young man’s faith journey. Imagine the work that the Lord has been about across Arizona State University (ASU) if this is only one man’s story! While Herman’s journey has been recorded, many others give testimony to God in their hearts. God has been about a work of renewal in His children’s’ lives here at ASU! We are praising God for how he has loved, healed, renewed, and strengthened His people this year, and we are confident that He will bring to completion the good work He has begun. "God’s grace is real! I want to share my story with you, and where I would like to start is by sharing about myself. First, my name is Herman Flores, I have 7 siblings and I am a current business student at ASU. When I was younger, I grew up with 3 older siblings and my parents. At some point within my childhood, my parents divorced, and I can honestly say that after that, we were a broken family. At the time of the divorce, I did not understand what was going on, but fast forward to my freshman year of high school, and these early childhood events really started to affect me. It was during my freshman year that my dad passed away from liver complications aggravated by his alcoholism. During this time, I was often confused, angry and impatient. Life had hit me hard. I had to mature quickly, and through the grace of God, I was able to preserve through this trial. Although I did not fully understand what God was doing during that part of my life, I have realized since that it was during that time that the Lord was molding me into a man and showing me that He will never leave my side. Michael and I after easter vigil. Michael was on the rcia team at the newman center and was a great resource for me throughout the year. As high school continued, God continued molding me. It was during my junior year of high school that I began my journey to Catholicism. In high school, I had many Catholic friends. Because of God’s grace, and having grown up Protestant, I was curious as to how our faiths were different from each other. Consequently, I began asking many questions and reading about Catholicism in order to learn more. As I did this, my misconceptions began to dissolve, and a genuine faith began to grow. In the fall of 2017, my first semester of college, I enrolled into the RCIA classes at ASU's Newman Center. Like many others coming into the Catholic Church, I battled through my first semester with doubt and confusion. For me, it was fear that caused my doubt and confusion; since my family is Protestant, I feared their judgment and disapproval. As I engaged this battle, it was the men of Saint Paul’s Outreach (SPO) who helped me through. The brotherhood and welcome that I received from these men was tremendous. I noticed and admire their lifestyle of accepting sacrifice, in order to further their relationship with God. The men living in the SPO Households really made me feel like I was part of the ‘team’ even as I was in this challenging point in my faith journey. They did this by simply welcoming me into their lives: I was going to morning prayer, to household dinners, and even sleeping there at times. I knew that I could always count on these men; this brotherhood called me on, it strengthened me as I engaged my doubts, fears, and my desire to be Catholic. Mr. Rich and i after the easter vigil. Mr. Rich mentored me in my conversion to the catholic faith. he was my confirmation sponsor as i entered the church. This past Easter, I came into the Church! It was an awesome experience; it would be challenging to describe how it all felt. All I can say is, “finally!” I worked hard and had to be patient, but the day of confirmation was a relief. I was finally able to rest in the Lord’s plan and be in communion with him. I could not be more appreciative of the time that I invested into becoming Catholic and the time that the men of SPO have invested in me. I am Catholic now! And I am blessed to have had so much support and encouragement along my journey. Thank you for reading my story." experiencing both joy and loneliness within community brought to life my recent experience of God! I have been urged on, to a deeper pursuit of him who loves us and who always has more for us! This month I had the privilege, nay, the pleasure (see A Knight’s Tale) of witnessing two of my closest friends celebrate the Sacrament of Marriage. These men, who I don’t call friends, but brothers, now leave their families and cling to their new wives. Both of these men I had met while coming to Household as an underclassman. One of theweddings, in particular, struck me - it was a witness to the brotherhood, the sisterhood and the pursuit of God that happens while living in Household. In this particular wedding, it was two Household Alum who were getting married. Almost everyone they had lived with in Household had some role to play in the wedding. Some were in the wedding party, many were in charge of setting up the reception venue, and some were altar servers. Even one of this year's SPO Missionaries, who the couple didn’t know for very long, was asked to be the DJ for the reception. We all celebrated and danced because of the joy that this couple has shared with us. When I think about it, the joy that they shared is really the joy of the Lord. Yet through all this joy and celebration, a sense of loneliness tried to pry its way into my heart. This dual sense of joy and loneliness at the wedding was consistent with my experience of this current semester. This semester, I had some extra time on my hands as I am a recent December graduate and was looking for work. The Newman Center on ASU campus had given me the opportunity to be a sacristan, and I was in charge of every noon mass throughout the week. Every day I had the opportunity to present Christ to His children in the Eucharist; yet I did not feel His Presence. Joy and loneliness. The funny thing is, even though I didn’t feel his presence, I knew he was there. That feeling of loneliness, was God calling me to himself. Something I learned in my period of unemployment was that the Lord will sometimes take a step back, and during that time it may seem that He is hiding from us. But in reality, though, rather than hiding from us, He is calling us deeper into pursuit of Him. An image that I thought of as I reflected on this deeper pursuit was a beautiful forest. In the forest, there are leaves on the ground creating a soft cushion under foot. The tree canopy towers above with olive green leaves and beautiful dark brown trunks. The trees are dense, but streams of light shine through the tree tops. Yet there is another light that appears as it dashes through the forest. 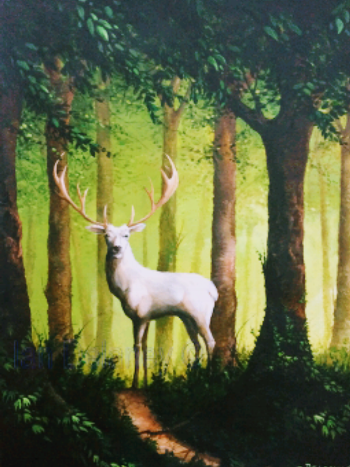 A beautiful white stag that glows with a radiant bluish light (think Harry Potter’s Patronus Charm) can occasionally be seen in clearings or behind trees, and I am in pursuit of this elusive prize; just to behold its beauty. This stag will every now and then appear to me and acknowledge my presence, only to run off into the wilderness again, and the pursuit continues. Sometimes I don’t see the beast, but I know it’s there in the woods with me. God is like this stag. He reveals Himself to us to give us joy and comfort. But He has something greater in store for us, so He dashes of into the wilderness for us to seek Him further still. So when we feel that God is not there, when we feel lonely, we should not become discouraged, but rather we should live in the hope that we will witness His beauty once again. We should keep on the pursuit until we finally come to His home, our home, Heaven. Here is the Fan into Flame crew - the 65 of us encountered the Lord on this awesome retreat! Going into February us students here in AZ were slowly starting to get into the full swing of school: tests, quizzes, and lots of homework. These things require a lot of hard work and discipline, which segues me perfectly into my thoughts about the beginning of my Lent. I’m going to be honest, Lent caught me a little off guard this year. Of course I knew it was that time of year, but I was just wrapped up in the chaos of the college student life. I felt like I hadn’t set aside enough time to prepare my heart for Lent. This is why the SPO Fan into Flame retreat could not have come at a more perfect time! This retreat truly readied my heart for Lent. The AZ Fan into Flame retreat was the weekend of the 16th-18th and it was an unforgettable experience to say the least. This retreat is called Fan into Flame because it puts a focus on the Holy Spirit - "For this reason I remind you to fan into flame the gift of God" 2 Timothy 1:6. What we engaged on the retreat was the fact that the sacraments instill the Holy Spirit in us but it is our job to invite the Holy Spirit in. To put it in metaphorical terms, its like chocolate milk: the Holy Spirit, like chocolate syrup, has been poured into us, the milk, but unless you stir it up, it won’t become chocolate milk, meaning we won't become His disciple with out this "stirring up" of the Holy Spirit (I stole this analogy from someone’s talk at the retreat so I can’t take credit). Anyway, it takes our action to call upon the Holy Spirit and ask him to be working in our lives, and that is exactly what we did at this retreat. there was a unique opportunity to build brotherhood and sisterhood on retreat, even while doing something as simple as engaging the talks and testimonies together. Classic school "fork 'em" showing up in the pictures: ASU pride! We had the opportunity to pray over one another in our small groups. Things like speaking in tongues, the gifts of peace and laughter were all things that we experienced together. Some people for the first time in their life! Praise the Lord. Speaking for myself, this retreat brought me healing and understanding from the Lord. He opened my eyes to a place in my heart where I really needed Him to work. The best part is that I am not the only one who experienced something like this. I know that everyone on this retreat had their own unique experience with God, and that is something so special. Thank the Lord for all the amazing leaders that we had on this retreat! Without them it would not have been possible. Moving forward from the retreat, I am continuing Lent with a new outlook: The Lord truly knows our hearts and He will show us all things in his time. Thanks be to God that He loves us unconditionally. This is my small group from the retreat! It was helpful to have other freshman women to share, process and pray with throughout the weekend. Across the board, small groups were impactful for us retreatants: for men and women, freshman through senior! Oh, and I almost forgot... we had lots of fun hanging out in fellowship and playing sports together. Within two hours I managed to play full, competitive games of volleyball, ultimate frisbee, and basketball. It was pretty dope. Overall, February has been a great month for SPO AZ with lots of opportunities to grow, dive into community, and be on on mission while being in the midst of the chaos of the college student life. Happy New Year from SPO Arizona and asuCatholic! As we enter 2018 and look forward to an event-filled semester here at Arizona State, I’d like to fill you in on what we’ve been doing here lately. Early in December, students (including myself) and staff at asuCatholic drove south to spend the first week of our winter break serving the community of Nogales, Mexico. Much like the trip last spring, we spent time at HEPAC, at the San Juan Bosco shelter, and in the community walking door-to-door in some of the poorest neighborhoods in Nogales. Sign as you enter HEPAC. English translation, "HEPAC home of hope and peace"
This year, however, we had a new mission theme: “Father… I pray that they may all be one, as you Father, are in me and I in you… so that the world may know that you love them as you love me.” Instead of focusing only on the service work itself, the goal of this mission trip was to unite two groups of people in solidarity by, to borrow a phrase from HEPAC, building bridges across borders. We placed more of an emphasis on personal interactions with the people of Nogales, whether it was walking through the neighborhoods, inviting the community to join us for mass, spending time with the ill and disabled in their own homes, or visiting the immigrants at San Juan. Even with what little Spanish most of us had, the people in Nogales were so patient and generous, and almost always offered to make or give us food at the houses we visited. We were also fortunate that the mission trip overlapped with the feast of Our Lady of Guadalupe, the largest and most celebrated day in almost all of Mexico. The level of excitement and celebration we witnessed downtown and in the Nogales Cathedral was unlike anything most of us had ever seen. I gained a lot personally from this mission trip, but if I had to sum it up in one point, it would be that I left Nogales with a great love and appreciation for Mexico as a whole, and a deep desire to return. Pictures (and videos) from the trip can be found at the links below. We hope you will keep us and all the students at ASU in your prayers as we enter this new semester! Do I have your permission to be honest right now? Alright, I am going to proceed assuming you are intrigued and responded with a “Yes.” However, I do not want to neglect any of the “No” responders out there; in the off chance you responded “No,” feel free to disregard the rest of this post. In all honesty, adjusting to life in Arizona as a missionary has been harder than expected. To provide a bit of context to this statement, I am a first-year missionary with SPO and moved from Minnesota to Arizona in August to serve at ASU. In all seriousness, although I love the weather in the midwest, I have always wanted the adventure of living in a warmer climate. Knowing my heart, the Lord called me to Arizona where I have enjoyed many days of … warm … above 100 degree … weather. Sidenote, I am just realizing how Minnesotan it is for me to be talking about the weather right now. Anywho, between the high temperatures and trapped arid desert dust, the valley of Phoenix has proven to be deadly for my allergy-prone immune system as I have battled several bouts of illness in these first few months. Besides the weather, there is a culmination of adjustments that anyone must go through when moving to a new place such as learning the “lay of the land,” building new relationships, and adjusting to new cultural norms (language, unwritten rules, common behaviors, extremely impatient and aggressive Arizona drivers, etc.). It is important to note that I share these things not to complain, but with a joyful and light heart as these things are all part of the adventure of life! However, these minor adjustments and challenges have been accompanied by a new influx of spiritual attacks (which comes with the territory of serving the Lord and is to be expected) that have proven to test my faith in a way I haven’t experienced before. Maybe you can relate? Have you experienced a time where for one reason or another, you were repeatedly stretched? Stretched to a point of true uncomfortability? From my experience, it has been during these times of my life where the Lord loves to “show up” in a powerful way. In these moments, He reassures me of His love, reveals His closeness, and asks me to trust Him. Last week, the Father again “showed up” in a powerful way during our household morning prayer. I want to share this encounter with you for two reasons: as a way to give thanks to the Lord and glorify His name, and to offer an encouragement to remain steadfast during any trials or difficulty, for our God is a faithful and all-loving Father who takes care of His sons and daughters. “During our time of worship in morning prayer, I received a closeness to the Lord, and it was a sense that I was worshiping the Lord face to face in His kingdom. The image wasn’t clear, but I was singing to Him as if He were right in front of me. As worship closed, the Lord was there and I approached Him, kissing the wound in His left foot. As I prostrated before Him and held His foot, He picked me up and held me in His arms. I was a young boy. But I felt His heart beating against mine - He held me so close. This is the intimacy the Lord wants with me and all His children - to bring me so close, chest to chest in embrace, where our hearts can beat together, mine receiving from His. In His heart is found all of the grace, desires, and will of the Father. And He wants to bring me close to hear His heartbeat in the silence. It beats for all of humanity; it beats to bring healing, restoration, and love. Will you allow Jesus to pick you up, hold you close, and listen to His heartbeat? 'Twas the night after finals... Read more! In August, we started a youth group here in Tempe. Leading the youth group has enriched the college mission in ways that I never would have guessed. Despite the hype that comes around February 14th with cupid’s arrows being shot in the secular world, it was wonderful to be with women and remember that Christ has been and continues to shoot love arrows our way every single second of every single day since our conception. There are close to 70,000 students at ASU. So how are SPO members set apart? How do we touch hearts and grab souls of men and women on campus? The answer is: JOY. You know you live in Phoenix when the four seasons are: "maybe I could wear a jacket," "tolerable," "really hot," and "are you kidding me?!" It has finally dropped below 100 degrees here in Arizona, so we've entered the "really hot" season. We are finally able to enjoy being outside and doing outreach on campus without the risk of heat stroke. We are told in Hebrews 12:1 to "run with perseverance the race that is set before us;" but how fast we run and how far we go means nothing if we do not pass the baton of faith from this generation to the next. In life, two kingdoms are constantly at war; one is good, one is evil. In which camp will you choose to plant your flag? Twenty-four students faced this question on SPO Arizona's Two Kingdoms retreat beginning of February. What a semester it has been! Get a quick glimpse of it through this photo recap.